In June this year, Edinburgh Emergency Department doctors Matt Wilkes and Ellie Heath headed off to Bolivia to look after the 32 volunteers and scientists of the Edinburgh Altitude Physiology Expedition (APEX4). The expedition was based at 5,300m in Chacaltaya, high above the Bolivian Altiplano. The aim was to study aspects of altitude illness, including the genetics of high altitude pulmonary oedema (HAPE), blood coagulation at altitude and the effects of hypoxia on the right side of the heart during exercise. This unfortunately necessitated inducing good-going altitude sickness in the brave volunteers! 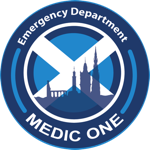 The Edinburgh Emergency Department and Medic 1 kindly donated a comprehensive medical kit to help the expedition along. This allowed Matt and Ellie to treat everything from severe HAPE to a lacerated toe while at the lab. At the end of the expedition, all the remaining drugs from the kit were donated to a local public hospital in La Paz. As South America's poorest country, medicines in Bolivian public hospitals can be scarce. The drugs will be put to good use before they expire.